This seminar on spiritual transformation is free of charge and open to all. 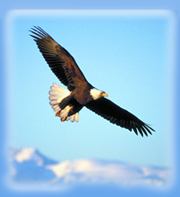 Discover spiritual tools and exercises that can help you gain a higher perspective, to become the eagle soaring gracefully through life. The 90-minute program includes talks, music, and poetry. Topics feature using inner guidance, dreams, and creative problem solving to help anyone find their inner greatness for living with more grace and understanding. After the program everyone is invited to stay for refreshments and fellowship. A selection of books will be available for sale and to browse, including the book the seminar is based on, We Come as Eagles—Discover Your Greatness as Soul, by Harold Klemp, the Spiritual Leader of Eckankar. Also included will be a spiritual art display and an invitation to a follow-up contemplation walk on Saturday, November 3, at Boundary Creek Natural Resource Area, 518 Creek Road, Moorestown, NJ.